Just because you do not see a complete set listed online does not mean that Dean's Cards can't build one for you. Almost all of our Pre-War Sets are built-to-order. Same with our 1952 Topps Complete Sets. No one does it better. Please just contact us and let know what you are looking for. 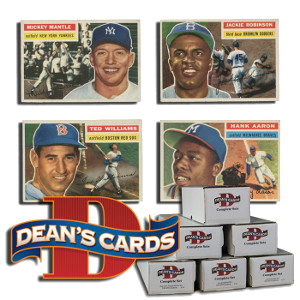 Dean's Cards has hundreds of Post-War sets listed online and ready to buy. Each listing shows the actual enlarged scans of each of the cards that you will receive. The complete sets that we Build-to-Order are mainly the pre-1948 sports issues, 1950s complete sets - that grade Excellent/Mint 6 or higher, and 1960s sets that grade Near Mint 7 and higher. The other vintage sets are already listed online, if we have them. Any set from 1970 and after is listed online if available and can not be obtained and acquired. Sorry. For more information on how we custom build vintage complete sets, click here. Please contact us for availability, pricing and any other questions that you may have.